Gene Autry is the only entertainer with all five stars on Hollywood's Walk of Fame, one each for Radio, Recording, Motion Pictures, Television and Live Performance. By the middle of the 20th Century, Autry was a box office smash with his musical B Westerns, touring with his rodeo across the United States and the British Isles, and had several gold records including his Christmas classic Rudolph, the Red-Nosed Reindeer. 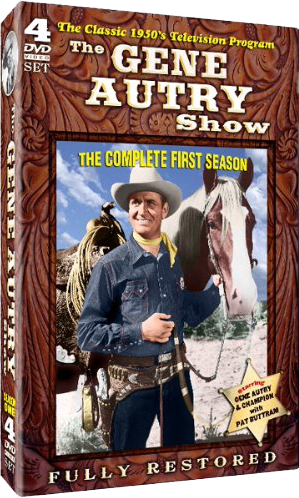 Autry's highly anticipated television debut on CBS-TV, July 23, 1950, placed him immediately in the ranks of television's top most attractions. What's more, with TV, America's beloved cowboy star added still another to his long list of illustrious "firsts." He became the first topflight motion picture star to make films especially for the Golden Age of Television. The Gene Autry Show, sponsored by Wrigley's Doublemint Chewing Gum, originally aired on CBS from 1950 to 1955. 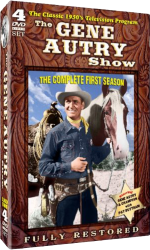 The program follows the adventures of singing cowboy Gene Autry, his Wonder Horse Champion, and his side kick Pat. Each unique show has Gene's trademark mixture of action, comedy, and singing.